1 Person Emergency Fanny Pack A roomy fanny pack, that's great to keep in the office, or car. 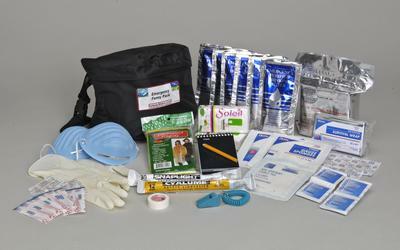 The kit provides food, water, light, heat, first aid supplies and more. Practical items that you would need if you were stuck and could not get home. 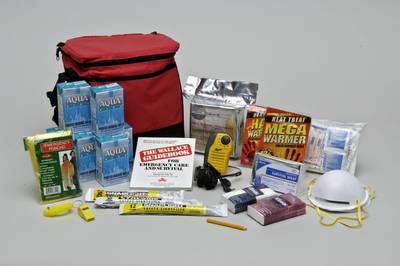 Unlike some emergency preparedness kits it has room for you add additional supplies (medications, spare glasses, flashlight emergency information etc. Antimicrobial hand wipes or gel. Contact us if you would like these kits imprinted or embroidered with your company name.